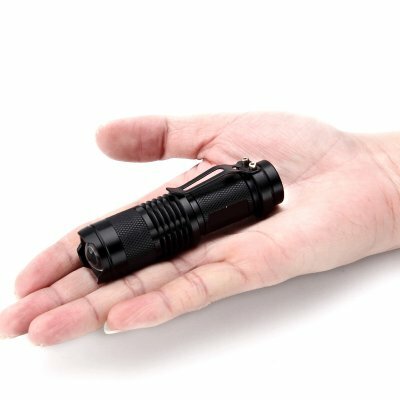 Successfully Added LED Mini Flashlight - 350 Lumens, 3 Light Modes, Telescopic Focus, Aluminum Alloy, 14500 Battery to your Shopping Cart. This mini flashlight lights up the path in front of you anywhere you go. With its compact design, this CREE LED flashlight can be easily carried around in your pocket. It is lightweight and has been crafted out of a durable Aluminum alloy. This makes your pocket light extremely durable. The flashlight itself is powered by a single 14500 battery (not included) and brings along hours worth of usage time. If you’re looking for a small backup light for in your emergency tool kit, this flashlight is a perfect gizmo for you. Being equipped with a clip, this mini pocket light can be easily attached to your equipment and carried along. Although small in size, this CREE LED flashlight is capable of producing a sufficient light source. It’s 7W LED produces up to 350 lumens of bright light. You’re treated to 3 different lighting modes. This means that you can use your flashlight efficiently in any type of situation. Your CREE LED furthermore features a telescopic focusing function. No matter the environment, this mini pocket light will always provide you with light in the darkness. This mini flashlight comes with a 12 months warranty, brought to you by the leader in electronic devices as well as wholesale electronic gadgets..